Fans of progressive slots will be well aware that Mega Moolah is one of the most iconic jackpot slots out there; it remains one of the most popular slots at Microgaming-powered casinos and it’s now joined by Mega Moolah Isis. This new game also features a progressive jackpot and, rather than the animal-themed predecessor, it’s subject is Ancient Egypt. 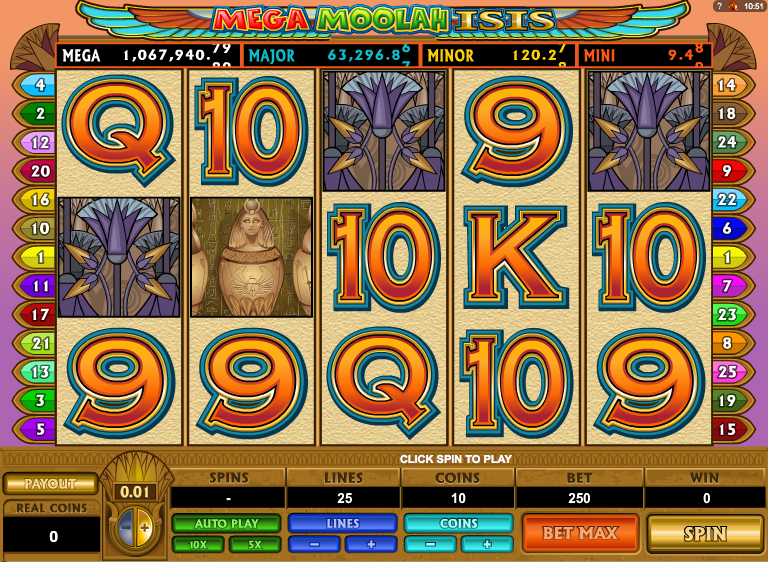 Mega Moolah Isis joins a growing crowd of Egypt-themed slots and it’s played over five reels and twenty five paylines; slots fans will of course be aware that Isis was the Egyptian god of fertility and she’s the wild symbol in this game, capable of winning you 10000 coins for five on an active payline. The scatter symbol is the eagle and then there are five there are five other major symbols including a golden orb, the Eye of Horus and a sarcophagus. Playing card icons make up the remainder of the symbols. 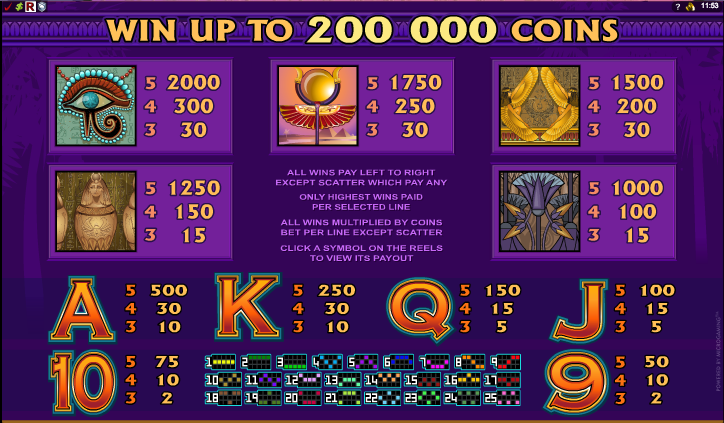 All wins are subject to a 6x multiplier so even landing just 20 spins should earn you a decent profit. The Wheel of Fortune ensures you will always win something but just one segment points to the big prize. Put your most recent win on the line (but not progressive wins) clicking the ‘Gamble’ button and playing a card prediction game. Double your winnings by choosing the correct colour or quadruple them by selecting the correct suit. The likelihood of triggering the progressive jackpot is increased by upping your bet amount so do that, as long as you feel comfortable with the increase. This is a high quality slot with a generous bonus feature and some well-animated icons; the progressive jackpot is the icing on the cake.